198 pages | 3 B/W Illus. This book offers a political anthropological discussion of subversion, exploring its imbrication with technological and divinization practices, and uncovering some of its particular effects on human existence, from prehistory until the contemporary age. Subversion is often romanticized as a means of opposing or undermining power in the name of supposedly universal values, yet techniques of subversion are actually deployed by people of all modern political and philosophical persuasions. 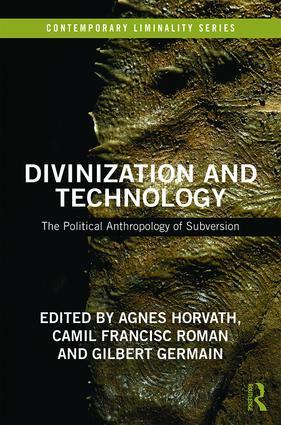 With subversion having become a tool of mainstream ‘power’ that threatens to dominate social and political reality and so render the populace servile and subject to a generalized culture industry, Divinization and Technology examines the ways in which technology and divinization, with their efforts to unite with divine powers, can be brought together as modalities of subversion. "This volume connects three concepts – which in the first instance appear to be unrelated or even contradictory - as constitutive components of our modern existence: technology, divination and subversion. In fact, and as the authors show, technology has a lot to do with human attempts to attain divine power, which at the same time subvert existing order. Provocative, and with what is sure to be a profound impact, this book, with authors from multi-disciplinary backgrounds, forces sociologists, political scientists, philosophers, historians, and theologians alike to re-evaluate their pre-conceived ideas." Ivan Szelenyi, William Graham Sumner Professor of Sociology and Political Sciences, Yale University, USA. "Will the Divine save us? It depends. This book follows a resolute path in explaining why. Human life has been sustained by recurrent addictions to a plenitude that is not always in our cards. The promises of unlimited growth and the ‘trickling down’ of wealth, the building of God’s Kingdom on earth, are not just showing their intrinsic limits. The perceptive and uncompromising explorations of the group of scholars who have contributed to this book show, from a variety of disciplinary and socio-cultural perspectives, how it is the process itself of claiming one’s due with whatever means (ethical, legal, political) that has accelerated the collapse of modern innerwordly eschatologies. Their serial subversions of ideals of good life in harmony with the cosmos have transformed human sociability into a ‘Game of Thrones’ of mutually imitative, and spiraling competitive, claims and counterclaims. The contributions to the volume suggest how the biopolitical forms of management of social and political life are not the outcome of a mere technocratic summoning of divine omnipotence from the top down. They are increasingly internalized by subjects who intensify and so ‘valorize’ the liminal whirlpool of self-feeding energeia (e??? ?e?a), as shown by the dynamics developing in such different fields like economic theory, social media, and drinking habits." Armando Salvatore, Barbara and Patrick Keenan Chair in Interfaith Studies and Professor of Global Religious Studies (Society and Politics), McGill University, Canada. "This is a subversive book as it addresses the elephant in the room of modernity: our latent desires and the overt fear and anxiety of becoming gods in a cosmos we have declared to be essentially meaningless and amoral – a declaration which emerges, as the authors claim, out of a social cosmos characterized by subversion and schismogenesis. This is a bleak and yet stimulating description of our modernity; a description, which even though does not guide you to how to save the world, at least explains why it is damned." Manussos Marangudakis, Professor of Sociology, University of the Aegean, Greece. "The present volume may, at first blush, seem to propose unlikely connections and resonances among concepts one does not usually associate with one another, namely 'subversion', 'technology' and 'divinisation'. This intuitive response should not lead one to ignore the reasoned claims of its authors, for they are as timely as they are significant for any attempt to recuperate a sense of what it means to be a person in the face of a 'divinising' technocratic culture that continually, endlessly, 'subverts' one's sense of self, replacing it with uncertainty and mere mimicry. It confronts one with the paradoxical task of 'subverting subversion' in the specific sense attributed to the concept here." Bert Olivier, Extraordinary Professor of Philosophy, University of the Free State, South Africa. Agnes Horvath is a founding and chief editor of International Political Anthropology. She taught in Hungary, Ireland and Italy, and was affiliate visiting scholar and supervisor at Cambridge University. Camil Francisc Roman is Lecturer in Political Science at the John Cabot University, Roma Tre University and LUMSA University, Rome. He is also an acting editor of International Political Anthropology. Gilbert Germain is Professor of Political Thought at the University of Prince Edward Island, Canada. He is the author of several books, including Thinking About Technology: How the Technological Mind Misreads Reality and Spirits in The Material World: The Challenge of Technology. This series constitutes a forum for works that make use of concepts such as ‘imitation’, ‘trickster’ or ‘schismogenesis’, but which chiefly deploy the notion of ‘liminality’, as the basis of a new, anthropologically-focused paradigm in social theory. With its versatility and range of possible uses rivalling and even going beyond mainstream concepts such as ‘system’ ‘structure’ or ‘institution’, liminality is increasingly considered a new master concept that promises to spark a renewal in social thought. In spite of the fact that charges of Eurocentrism or even ‘moderno-centrism’ are widely discussed in sociology and anthropology, it remains the case that most theoretical tools in the social sciences continue to rely on taken-for-granted approaches developed from within the modern Western intellectual tradition, whilst concepts developed on the basis of extensive anthropological evidence and which challenged commonplaces of modernist thinking, have been either marginalised and ignored, or trivialised. By challenging the assumed neo-Kantian and neo-Hegelian foundations of modern social theory, and by helping to shed new light on the fundamental ideas of major figures in social theory, such as Nietzsche, Dilthey, Weber, Elias, Voegelin, Foucault and Koselleck, whilst also establishing connections between the perspectives gained through modern social and cultural anthropology and the central concerns of classical philosophical anthropology Contemporary Liminality offers a new direction in social thought.